CityLink have announced changes to their Galway - Dublin services from Wed 1 May 2013. They will be running services directly between Galway and Dublin Airport - not travelling via Dublin City Centre. These services are operated under their new Eireagle brand. Currently the Eireagle timtable implies that these will be instead of the regular CityLink express Galway - Dublin services in these hours. 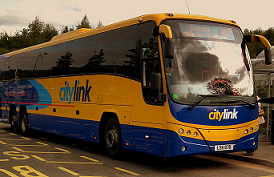 But the Citylink website is still allowing bookings for these times - at the reduced on-line prices that Eireagle.com have been advertising. So it is currently unclear if the Eireagle services are additional or not. See the Regional Buses Services page for other bus services between Galway and Dublin.